Dark streets Reviewed by Edgeville Buzz on September 30, 2009 . A reader wrote in pointing out how pitch black the stretch of Berwyn is from the El Red Line stop east to Winthrop. This is exactly the area that Rocco Lopez tragically lost his life when he was stabbed in the neck on the night of Saturday September 19th. While there is a street light just east of the tracks, this street is also covered by trees which block the little light this one street light provides. Our suggested solution? 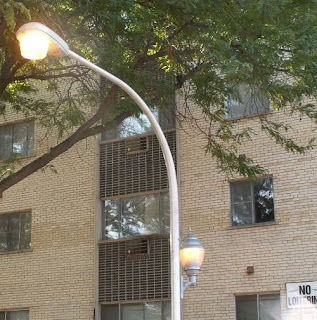 Either more street lights, or ones like this one below (which can be found all over Lakeview and Lincoln Park, by the way) which not only light the street, but the second light shines on the sidewalk, below tree level, as well.